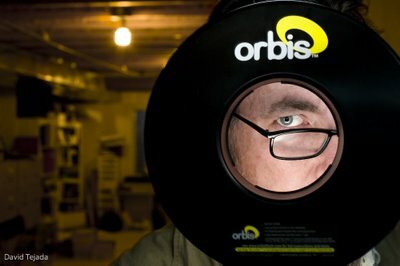 As promised, I used my new Orbis™ Ring Flash during my most recent SSBR workshop. I have two photos that I shot using the ring flash I wanted to show. The first is your typical up against the wall, ring flash shadow type shot. I'm not so much interested in using the ring flash for these kinds of shots, maybe on a rare occasion. This is our model Lorraine standing in front of the painted background hanging in the studio. I plan on using the ring flash primarily for fill light. The ring flash is ideal for this purpose as the light it produces is basically shadow free. I use the ring flash for that very purpose in the illustration below. The first shot of Colin is without the ring flash. The ring flash is a very convenient tool to use to provide some needed fill, provided that the fill does not need to be really soft. The size of the light source, the ring flash, is not very large. As you know, the larger the light source, the softer the quality of light. This was really the first time playing with the Orbis™ Ring Flash, I'm sure I'll have plenty more opportunities to do so. I nice to have another tool in the bag for those special shots. I have several workshops coming up that you might be interested in. Eastern State Penitentiary, Philly, March 20th San Francisco April 13th and Orange County, CA April 16th. I'll also be teaching a week long workshop for The Santa Fe Photographic Workshops in late March and in September I'll be in Maine teaching at Maine Media Workshops.